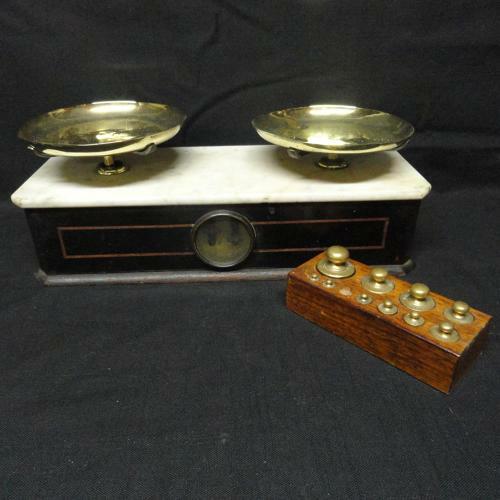 This is an antique balancing scale made by Parnall and Sons. The firm has been making England’s best scales since 1820. The perfectly balanced piece was made to hold dairy,meat or pharma products as they were being weighed. 14 inches long x 5 1/2 inches wide x 6 inches tall. Solid brass trays perched above a slab of marble, small corner chip. Intricate metal balances to the interior that are still precise. Lovely patina to the old English oak stand. Comes with a 10 piece brass and oak set of weights.